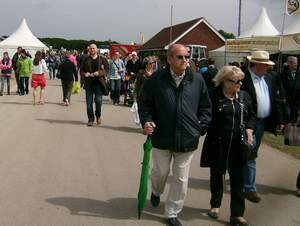 This year’s Lincolnshire Show will come to life at the 200 acre Grange-De-Lings site on 20th and 21st June, with world-class jousting from the Knights of the Damned, two qualifier heats for the Kennel Club’s Scruffts mixed breed dog show; top level show-jumping and a host of shopping opportunities. Reflecting the agricultural heart to the Show, this year’s events will include the ever popular pig racing; the spectacular Grand Parade of the best of the county’s livestock and the vintage to modern day agricultural machinery display. As well as the county’s finest animals on show, there will be an exciting mix of rural and family attractions during the two days, including the best of Lincolnshire produce at the massive Select Lincolnshire and Tastes of Lincolnshire Food Court, home to a mouth-watering selection of local produce and some great homemade recipe demonstrations throughout each day from local food champion Rachel Green. The Discovery Zone will be hosting Pork to Fork : The story of the Sausage, explaining how one of Lincolnshire’s most famous products reaches the table, and other Show performances will range from falconry to bee keeping. Clydesdale Bank and Duckworth’s Land Rover are once again major sponsors for the Show, where one of the star attractions is Knights of the Damned, the medieval jousting stunt team, regular favourites at the Show. This year they will be in prime position, having moved to the Main Ring, where they will appear on both Show days, led by Justin Pearson, whose film credits include Harry Potter, Pirates of the Caribbean and most recently the Madonna film WE. The troupe includes two young local riders, Rob and James Pavey. Their display includes high adrenalin clashes on horseback and superbly choreographed foot fights with swords, flaming fireballs on chains and unyielding quarterstaffs. This year’s Sports Zone has top billing in the run up to the 2012 London Games, and will be encouraging visitors to try their hand at a huge range of Olympic and Paralympic sports. This year’s sports include cricket, golf, wheelchair basketball, canoeing, volleyball, table tennis, hockey, athletics and the ever-popular Zorb Balls. The Sports Zone is one of Lincolnshire Sports Partnership’s biggest events and last year nearly 6000 people took part in the Sports Zone over the two-days. For the second year running, dogs will be allowed on the Showground, with dog rescue centre Jerry Green running a doggie crèche on both days. Scruffts have confirmed that they will be running a regional heat on both days of the Show this year for their Family Crossbreed Dog of the Year competition, giving Lincolnshire two regional winners in the 2012 national final. Also confirmed is an appearance from Merlin, the ambassador dog for Hearing Dogs for Deaf People, who is on a special mission to raise £30,000 for the charity during its 30th anniversary year. The charity trains dogs to alert deaf people to important sounds and danger signals in the home, work place and public buildings. More than a thousand young people will be taking part in the Schools Challenge over the two days, demonstrating their understanding of food, farming and agriculture, as well as having a go at making sausages with Uncle Henry’s cafe and farm shop. This year’s challenges range from learning about the optimum growing conditions for potatoes, to coming up with a marketing strategy to encourage young people to visit the Lincolnshire Show. There is also special entertainment for the Wednesday evening, with the Bush Doctors band. The cover band has been playing to audiences all over the UK during the past 12 years, and this year sees them playing the outdoor stage at the Lincolnshire Show, in the Lincolnshire Agricultural Society members’ area. And according to lead singer Richard Aksam, the band will be delivering a set that’s designed to suit all tastes and guarantee that everyone is swinging along. He said: “This promises to be one of the biggest and best gigs of our summer schedule." For shoppers, there will be boutique-style stalls in the Mews and a shop-to-drop experience at the 600 trade stands at the Show, offering anything from a new car to a pair of shoes. Jayne Southall, who will be leading the Showground team in her first year as the Director of the Lincolnshire Agricultural Society and Lincolnshire Events Centre, said: “We’ve got a fantastic line-up for this year. “The heart of the Show is to tell the story behind the county’s agriculture and food production and to encourage more people to put local produce top of their shopping list, but it is also a major visitor attraction which helps to bring Lincolnshire’s wider visitor and tourism story to a national audience.